Conservation education is a natural extension of Notre Dame's curriculum. 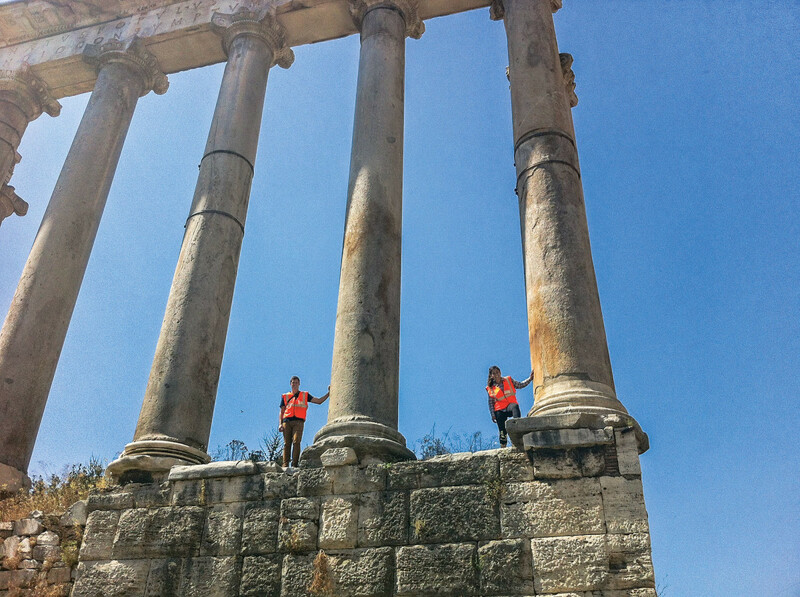 Historic preservation students participating in the DHARMA program directed by Professor Krupali Krusche documenting the ancient Temple of Saturn at the Forum in Rome. Students learn techniques like laser scanning and GigaPan photography, but also measure and draw by hand to develop the broadest range of skills necessary to document historic sites in the field. 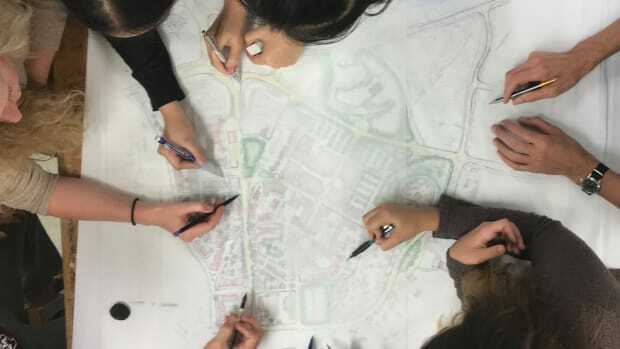 The School of Architecture at the University of Notre Dame began implementing a curriculum based on classical architecture and traditional urbanism in 1989, and for the more than a quarter-century since then, it has had a measurable impact on the profession. Directly and indirectly, the School has contributed to a more open and pluralistic culture, both among practitioners and academics, and has forged links with like-minded sympathizers internationally. The teaching and research of the faculty, the professional work of alumni, and public programs like the Richard H. Driehaus Prize and Henry Hope Reed Award, have opened up room for debate that simply did not exist in years past. The ripple effect of the School’s influence extends beyond new traditional architecture and New Urbanism to include historic preservation and a soon-to-come graduate program uniting the schools of Business, Law and Architecture to promote sustainable real estate development. Preservation has been an optional undergraduate concentration since 2007, and last year the School conferred its first Master of Science in Historic Preservation (MSHP) degree. With nearly 40 US universities offering graduate degrees in historic preservation, Notre Dame’s MSHP program distinguishes itself from its peers in two primary ways: its curriculum grounded in traditional architecture and urbanism, and its international perspective. Teaching preservation at Notre Dame is a natural extension of its curriculum because learning how to design new traditional environments is relevant to the care of existing historic buildings, districts, and landscapes. 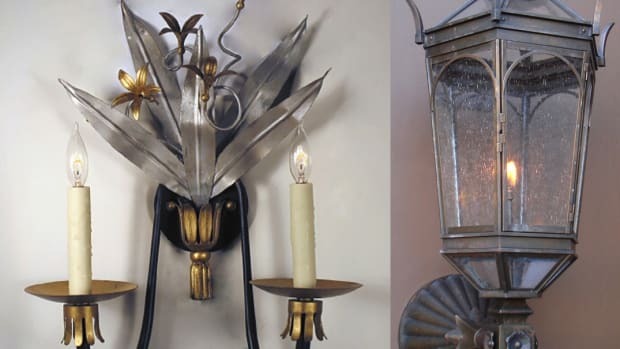 While all of us have grown up in the age of Modern Architecture, few preservation professionals are experts on the design of pre-Modern buildings. As I wrote in an earlier article (“What’s an Architrave? Announcing the New Graduate Program in Historic Preservation,” Traditional Building, October 2014), preservation students are not typically trained in the historical formal languages that characterize the bulk of what they will be asked to preserve. Learning about historical styles and building cultures “from the inside” is essential to conserving historic places because success in the field requires knowledge of and respect for how those sites came to be, how they were made, and how their significance has evolved through time. The best conservation practice requires the architect to identify, draw, analyze and restore the multitude of elements, both utilitarian and aesthetic, that make up our architectural heritage and, when called upon, to add to the heritage in ways that promote harmony and continuity of character rather than contrast and difference for its own sake. 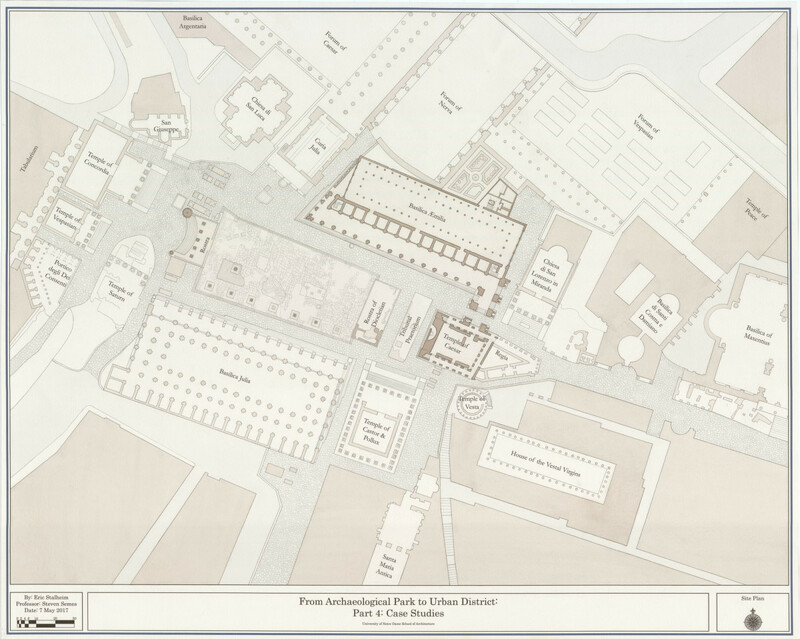 Eric Stalheim’s Master’s Thesis brought him back to Rome to prepare a conservation and development plan for the Roman Forum that seeks to re-connect the archeological area with the rest of the city. 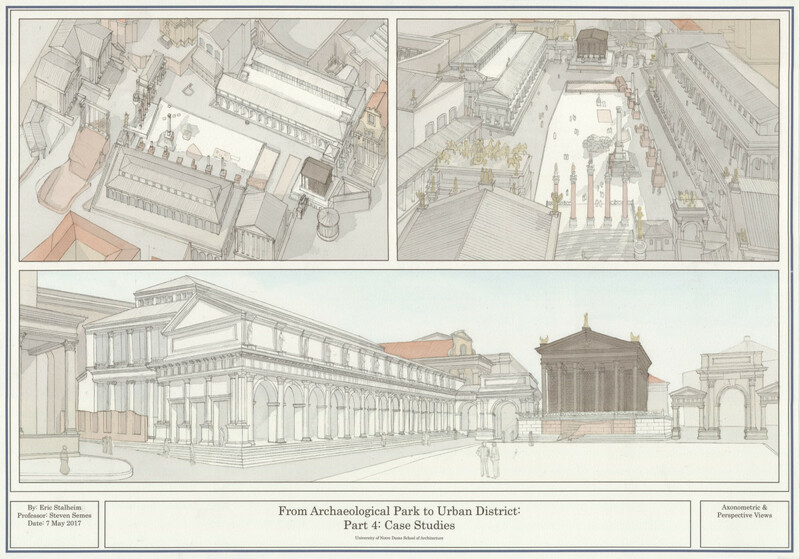 He proposed re-establishing the ancient street network and suggested preservation treatments for the principal buildings, then focused on two case studies: a graphic reconstruction of the Basilica Aemilia and a replacement structure for the Temple of the Divine Caesar, showing two different treatments based on our knowledge of the original configurations. Secondly, the Notre Dame program sees preservation efforts in the United States within the context of heritage conservation worldwide. Part of this arises naturally from the now 50-year-old Rome Studies Program that takes the School’s undergraduates to the Eternal City for their entire third academic year and graduate students for one semester. Rome, in addition to being an essential resource for the study of classical art and design, is also a world center for heritage conservation. In addition to the hundreds of historic sites—from the grandeur of the Imperial Forums to more intimate sites like the Church of San Clemente, both just around the corner from Notre Dame’s building—the city is also home to a vast public administration dedicated to the preservation of its historic sites, major university programs, training and research organizations like ICCROM and ICOM, the library and museums of the Vatican, and a host of independent professionals in preservation and restoration of all kinds. It is perhaps the world’s most extensive conservation laboratory. Another international experience open to students is Notre Dame’s DHARMA program (the acronym standing for Digital Historical Architectural Research and Material Analysis), led by the current Academic Director of the Rome Studies Program, Professor Krupali Krusche, in which architecture and conservation students employ new technologies to record historic sites like the Roman Forum and the Belvedere Courtyard at the Vatican. Using high-definition laser scanners and GigaPan photography, the team has documented the existing state of these and other sites in unprecedented detail. Traditional methods of hand-measuring and photogrammetry are also used to supplement the data gathered by digital techniques. These documentary studies have led to new understanding of the original construction and subsequent changes that have shaped these sites through the centuries, better informing us about their future preservation. The first graduate of the new MSHP program, Eric Stalheim, was particularly affected by his experience in Rome. An Iowa native, Eric began his Notre Dame studies in 2015 with the introductory design studio course Elements and Principles of Classical Architecture and the seminar History and Theory of Preservation, followed by a semester of Research and Documentation of Historic Sites and a studio in Urban Conservation, among other courses. He traveled to Rome in the fall of 2016, where he completed another design studio project to re-urbanize the area around Rome’s famed Bocca della Verità. A course called International Conservation Laboratory began with a study of the international documents on conservation (such as the ICOMOS Charters) and then provided hands-on experience with professional architects and restorers working in Rome, including Paolo Vitti. As part of this last course, Eric created “The International Documents on Heritage Conservation: A Guide to Their Evolution and Meaning,” a poster-size table that arranges excerpts from a dozen of the most important international statements side-by-side and in chronological order, organized according to topics ranging from Authenticity to New Construction. The documents extend from the Athens Charter of 1931 to the Historic England Advisory Note on Reconstruction of 2016, and include the US Secretary of the Interior’s Standards for the Treatment of Historic Properties of 1977. One can read across the table’s rows to understand how any document addresses each topic or read up and down to compare how different documents address a single topic. 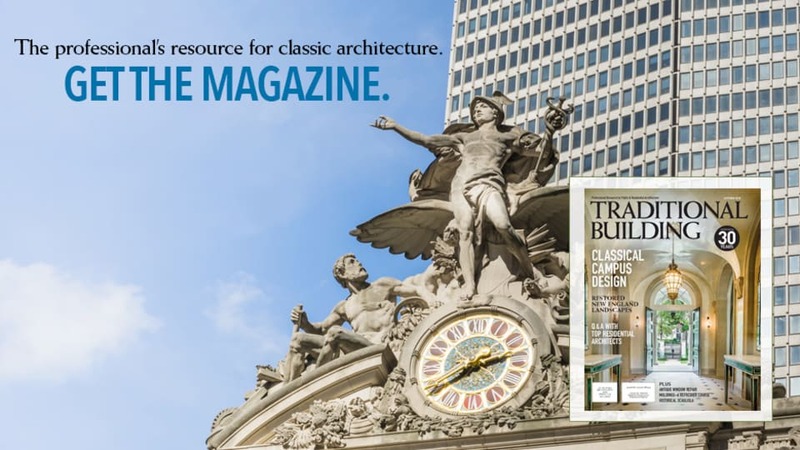 Several prominent preservation leaders who have seen early drafts have found the matrix, as Eric calls it, a valuable resource for increasing the awareness of American preservationists about the international context in which we all work. Eric is now seeking publication of the complete matrix, a portion of which is previewed here. The matrix allows a comparison of ICOMOS Charters and other documents to understand how preservation thinking has evolved over the last nine decades. It also reveals that some conventional ideas in the field have little basis in the official policy statements. For example, on the subject of new architecture in historic settings, the 2011 Valletta Principles call for “a continuity of composition that does not adversely affect the existing architecture but at the same time allows a discerning creativity that embraces the spirit of the place.” The documents’ increasing emphasis on intangible heritage and the use of traditional materials and techniques in restorations and infill construction makes it difficult to sustain the frequent insistence by preservation authorities on conspicuously different modern materials and forms intended to “differentiate” old and new or represent “the architecture of our time.” Thorough reading of the international guidance shows a more subtle understanding of the relation between new and old architecture and supports Professor Vitti’s emphasis on the use of traditional materials and methods. 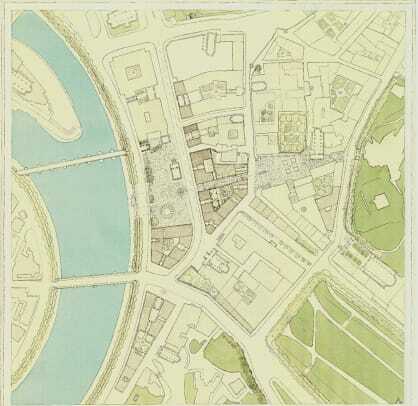 The thesis project, presented in hand-drafted watercolor-wash renderings, won the praise of faculty and guest critics. As a consequence of his Rome experience, Eric plans to pursue a career in the conservation of antiquities in Italy. Just as the primary value of traveling abroad is to come home with a wider vision, so the experience of Rome contributes to our students’ appreciation of their American heritage. Our undergraduates complete their academic year in Rome (now with a week in Paris along the way) with a one-week visit to Virginia and Washington D.C. Standing in front of Monticello or the Lincoln Memorial with their studies in Italy fresh in their minds, they see the many European threads that have contributed to the unique American weave. Students in preservation, too, take from their understanding of international conservation theory and practice a context within which the historic preservation movement in the United States finds its place, discovering that the challenges of Charleston, Chicago or San Francisco are not so different from those of Rome, Venice or Paris. This perspective can only enrich our practice here at home. 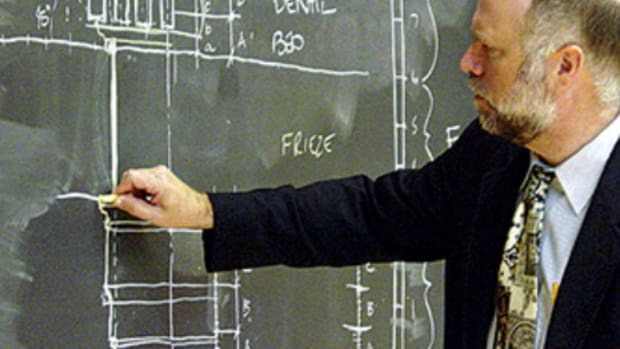 The MSHP program, recognized by the National Council on Preservation Education, is open to students with previous degrees in architecture; alternatively, those who complete the course of study for a professional architecture degree at Notre Dame can earn the MSHP degree with one additional year of study. For more information, please consult our website: architecture.nd.edu/mshp. Steven W. Semes is Professor of Architecture and Director of the Graduate Program in Historic Preservation at the University of Notre Dame. He was Academic Director of the Notre Dame Rome Studies Program 2008-2011 and currently splits his teaching duties between Rome and the main campus. He is the author of The Future of the Past: A Conservation Ethic for Architecture, Urbanism, and Historic Preservation (2009) and The Architecture of the Classical Interior (2004), and has also written for many publications. He was the 2010 recipient of the Clem Labine Award. The School of Architecture at the University of Notre Dame is launching a graduate degree program in historic preservation. 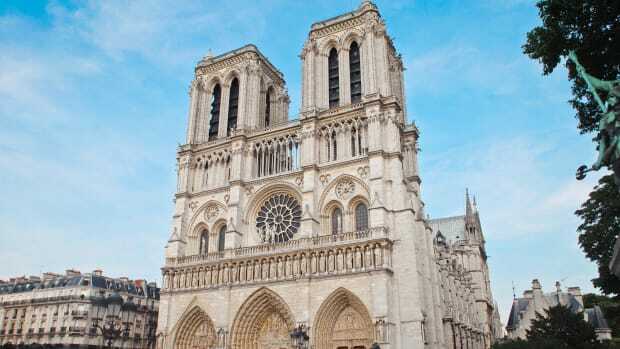 Let’s Help Restore Notre Dame Cathedral! Information on how to contribute to the restoration of Notre Dame Cathedral in Paris. The University of Notre Dame School of Architecture is collaborating with Tesla Inc. to create a design studio course focused on Tesla’s Gigafactory 1 based in Reno, Nevada.